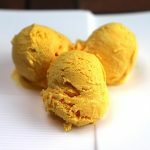 Mango ice cream recipe is my favourite seasonal ice cream, as I love to eat mangoes in summer. 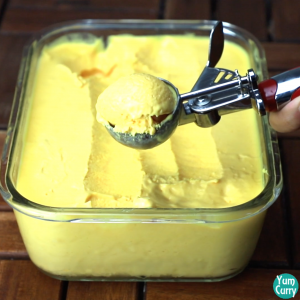 This mango ice cream recipe is very easy to make and it’s a 3 ingredient ice cream recipe. 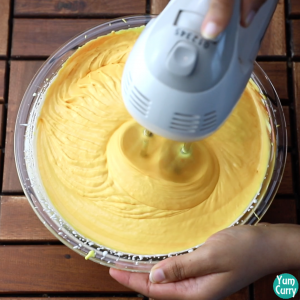 The only ingredients you need to make this ice cream are mangoes, whipping cream and sweetened condensed milk. 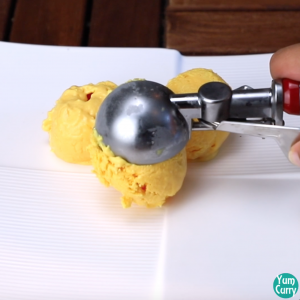 This mango ice cream recipe is eggless and no machine is used to make this. 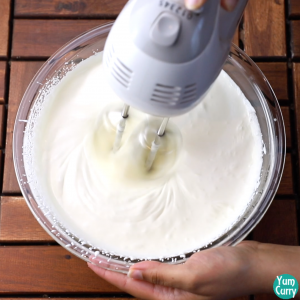 All you need is basic tools available in your kitchen which is an airtight container to se the ice cream in the freezer and an electric beater which makes beating the cream easier. Though you can beat the cream using whisker but trust me it’s very difficult and requires a lot of hard work and strength but it is possible. 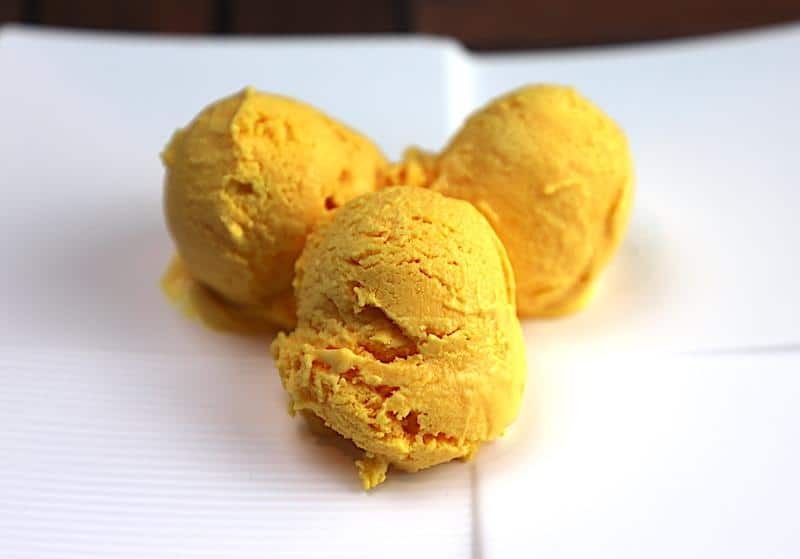 The result of this mango ice cream is very soft and creamy ice cream. Also I have used colour in this recipe but it’s totally optional. I have used it to make it look more colourful just like they serve in market or ice cream parlour. 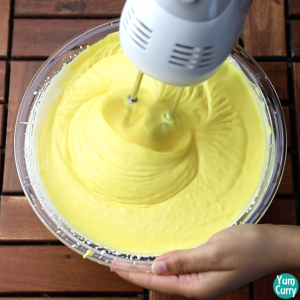 You can avoid this if you don’t like to use colour in your recipe. 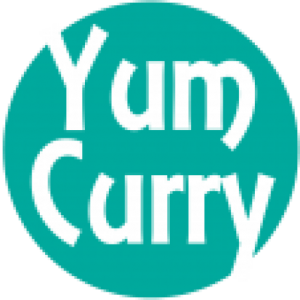 People also ask me what if we increase the amount of mangoes to avoid the use of colour, my reply is no you can’t do that if you want creamy and soft ice cream as the mangoes have lots of water so they are more likely to form ice crystals while freezing. 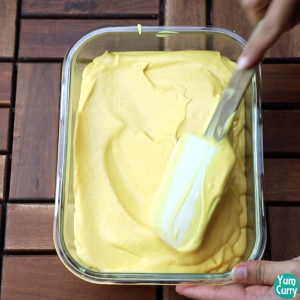 I hope you like this easy mango ice cream recipe from my kitchen. Please like and share it with your friends and family. 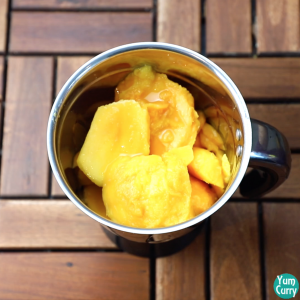 Take mangoes and chop them roughly, transfer it to a blender and blend it smooth. 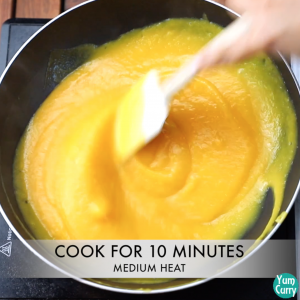 Now heat it in a pan and cook for 10-12 minutes. 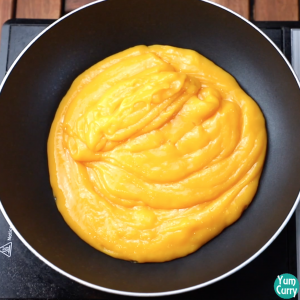 Keep stirring (this step is to retain the colour of mangoes). Turn off the heat when done and let it cool completely. 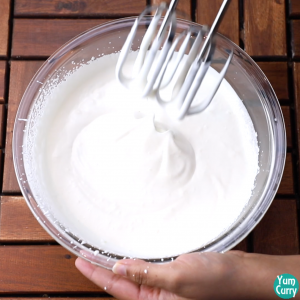 Take a chilled bowl and add chilled whipping cream to it. 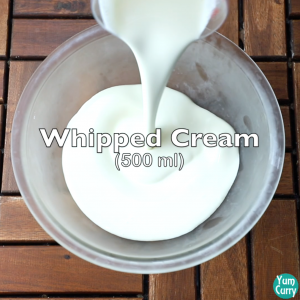 Add the chilled sweetened condensed milk or milkmaid to it. Beat it again until mixed nicely. 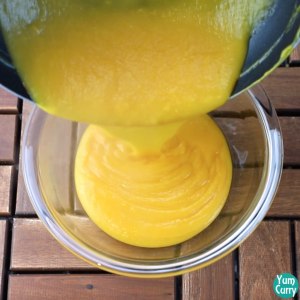 Now add the mango pulp to it and mix well. It's time to add some colour, this part is totally optional. 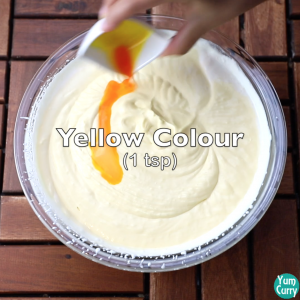 To get a nice colour like the one they serve in ice cream parlour, you need to add 2 colours yellow and orange. Add and mix them. Now transfer it to an air tight container and freeze it for 8 hours. Serve chilled. 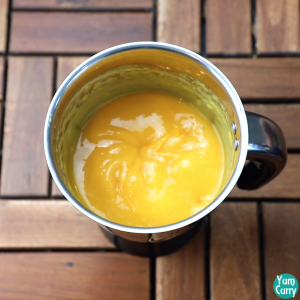 Cut mangoes roughly and blend it smooth in a blender. 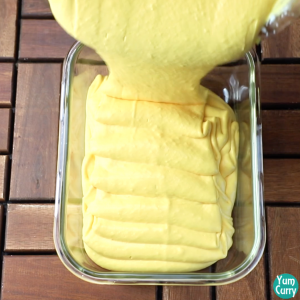 Transfer it to a pan and cook it for 10 minutes on medium heat. This is to retain the colour of mangoes. 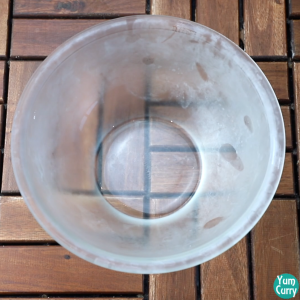 When done transfer it to a bowl and let it cool completely. 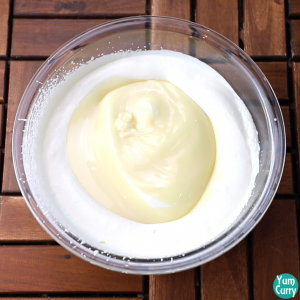 Take a chilled bowl (Keep the bowl in the freezer for 30 minutes) and add chilled whipping cream to it. 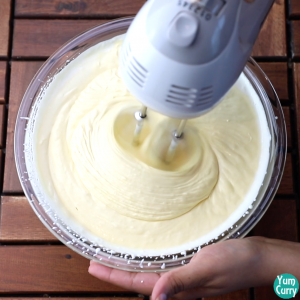 Whip it using an electric beater until stiff peaks formed (Approximately 10-12 minutes). 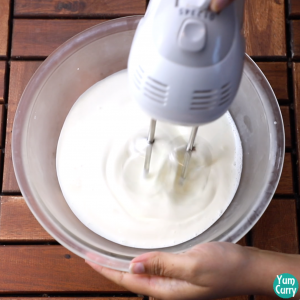 Now add the chilled condensed milk to it and beat it again to mix. 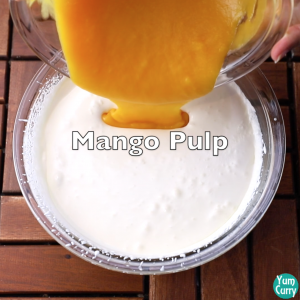 Add the mango pulp to it and mix well. It’s time to add food colour to it. This step is totally optional. 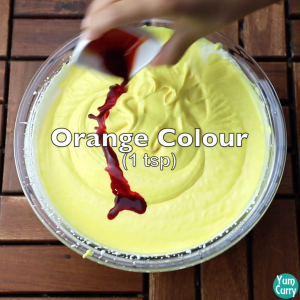 I have used 2 colours to get the colour like the store bought ice cream, so add orange and yellow colour and mix well. 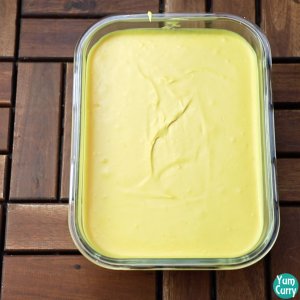 Transfer the ice cream to an air tight container and freeze it for 8 hours or overnight.